Many corporations match their employee’s gift dollar-for-dollar (or more!). These companies usually have specific requirements governing the matching program and require the school to complete a form as part of the process. 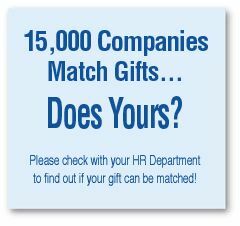 Families and friends are asked to contact their Human Resources Department for more information about their employer’s matching gift program. If you prefer to send us your gift through standard mail, you may do so by printing the gift form and sending it with your gift via mail. Although it is rare, some constituents do make cash contributions. However, we never recommend that donors send cash when using a postal service or courier. Donors wishing to make a cash gift, are asked to visit the Development Office so that Lakeview can issue a cash receipt. Checks are by far the most common method of giving. Donors should make checks payable to Lakeview Academy with an indication of the appropriate fund on the note line of the check. It is particularly important that donors include this note to ensure proper crediting of the gift. To give a gift using a credit card by phone, please call The Development Office at (770) 531-2604. Gifts of real estate often allow the donor to avoid capital gains taxes while realizing a charitable deduction. Gifts of real estate or personal property (e.g., jewelry, artwork, and collectibles) require prior approval of the Advancement Committee of the Board of Trustees. Some families prefer to be excluded from end-of-year giving lists; others desire complete anonymity. Lakeview always respects such decisions and indicates these types of contributions as “Anonymous” within the particular giving level. Constituents wishing to remain anonymous MUST indicate this on their pledge envelope (a box is provided) or in a separate letter to the Development Office. Gifts to Lakeview are a marvelous way to recognize students, alumni, current and former faculty, family members or friends. Honorees or families of memorialized individuals receive special note cards notifying them of the donor(s) and his/her/their thoughtfulness. (Gift amounts are not noted.) Honorary and memorial gifts are listed in the summer edition of the magazine. If you would like to make a gift of tangible goods, please contact the Development Office so we can be sure your in-kind gifts or services can be used to meet our most pressing needs.